I have seen so many posts on this restaurant that I finally decided to try it. The 'Lunch Unlimited' menu seemed like the best deal, and I decided to try that. The restaurant has a very cool and modern design as you would expect from a newly setup restaurant within the Esplanade. Although I visited the restaurant during the day, I could imagine that the outdoor bar with patio would be a nice spot for evening drinks and dining. Soft drinks and juices are free flow, as well as the food. 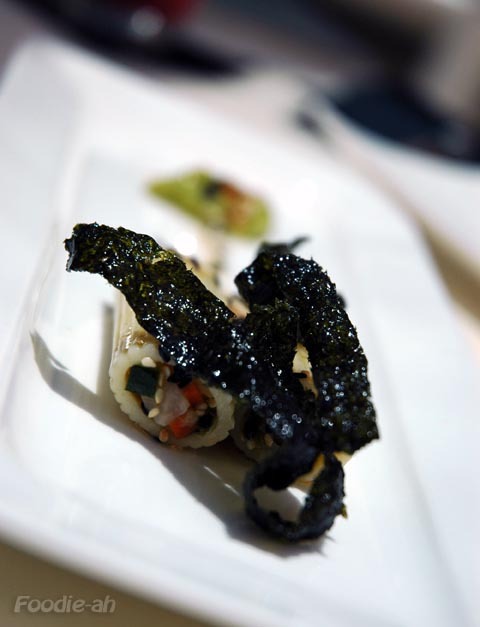 They keep serving new dishes until the courses are over, but you can always ask for extra portions of any dish you like. They opened up with a potato salad with beetroot and asparagus. A well presented dish, with a nice combination of textures. The pasta salad was Japanese style pasta with sesame seed, nori seaweed and a guacamole sauce served on the opposite side of the plate. Nothing surprising, but quite pleasant. I found the tomato tart a little confusing. The sweet tart base topped with mozzarella and tomatoes and complemented by a sweet basil ice cream was a little bit of a clash of flavours. 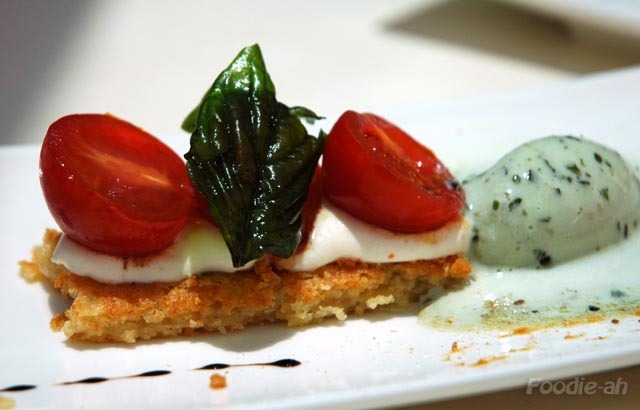 Being Italian, I believe that there are better ways of combining beautiful flavours such as basil and tomatoes. Well, they tried something different! 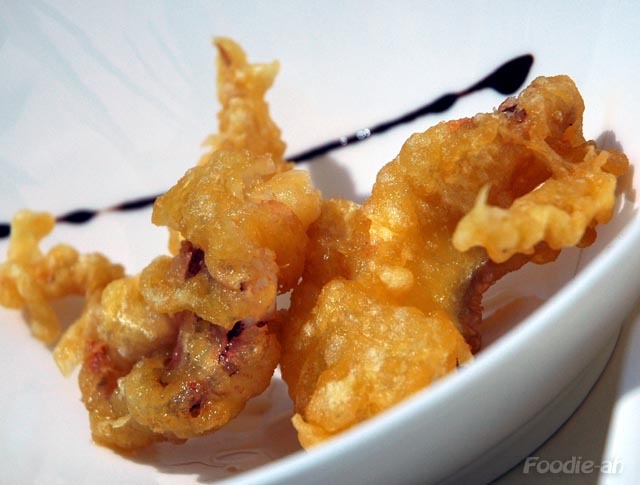 The squid tempura was without a doubt the worst dish out of all. Quite disgraceful, actually, as you can tell from the picture. This rock-hard, oily lump of batter gave me no reason whatsoever to eat it. Pretty frankly, I can have better deep fried seafood at a MacDonald! Luckily, the next deep fried dish, the cheese croquettes, was much better. 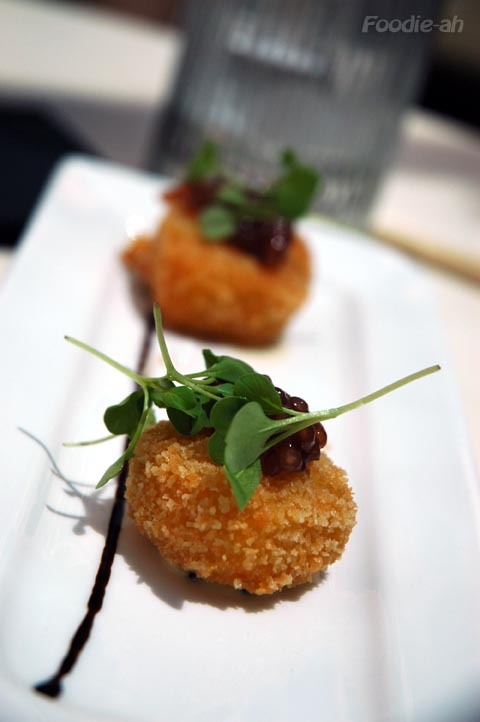 Nicely fried croquettes with melted cheese inside, topped by a sweet chutney. One of my favourite dishes was definitely the beef roll. 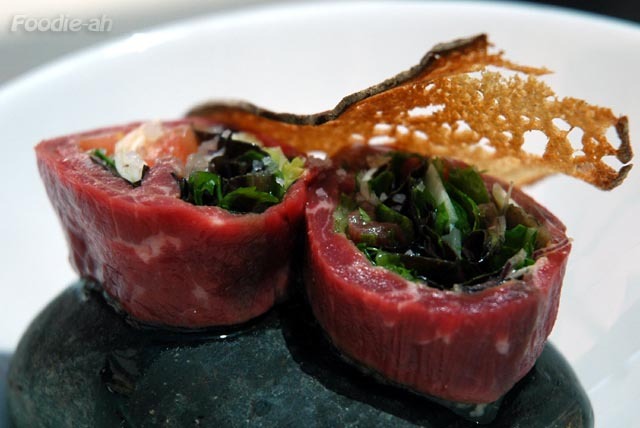 A roll of raw, tender beef Italian style, filled with tomatoes, rocket and Parmesan, served on a hot stone. Obviously the more cooked you want it, the longer you have to leave it on the stone. I enjoyed mine as raw as in the picture and ordered another one! Ranking second for disgracefulness were the risotto and the pasta. I returned them both. The edamame pasta was worse than what I can imagine "spagheddi's" would serve you -although I never adventured myself in there and never will :) It was just a mass of spaghetti, drowned into a creamy sauce that tasted so intensely of garlic I had to spit out my first (and only) mouthful of it. The mushroom risotto on the other hand, was not what you can call a risotto. I would rather call it a lump of melted cheese. There was no taste of mushroom in that whatsoever, beyond a lump of creams and fat with Parmesan-like taste and overcooked grains of rice emerging here and there... Obviously, these are dishes that you can't really prepare in advance and there is no room for cheating! 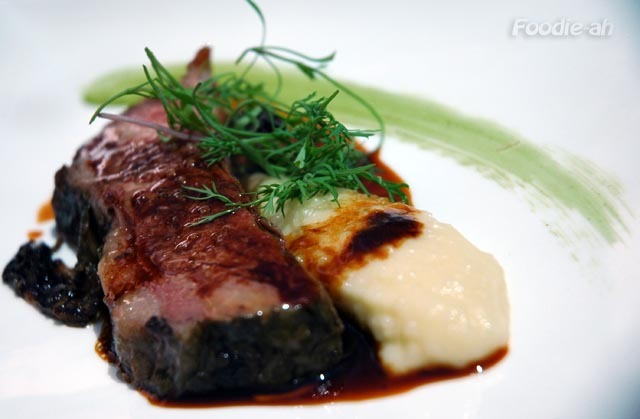 On a positive note, the lamb shoulder with polenta was tasty, tender and well balanced by the sauce, herbs and polenta bed underneath. This was a dish worth having! The red snapper on carrot puree' was also quite nice, although the extra serving that we ordered was a bit salty. 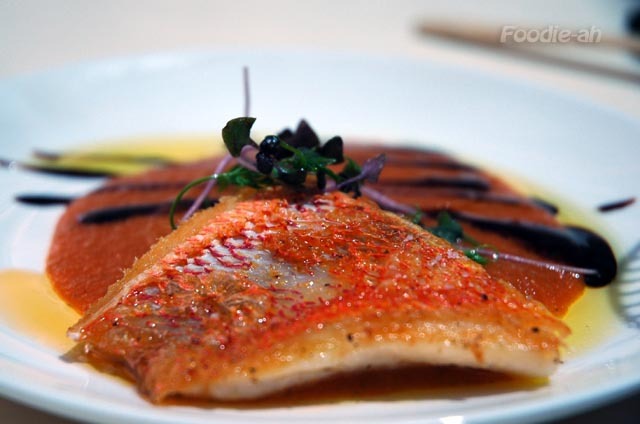 This dish consisted in a crispy pan fried fillet of red snapper, served with a sweet and sour think carrot sauce. The beef brisket with mashed potatoes was my favourite dish overall. The slowly braised meat was incredibly tender and juicy, the sauce was rich and tasty, balanced by creamy and buttery mashed potatoes. I ordered this dish a second time and it was just as good! 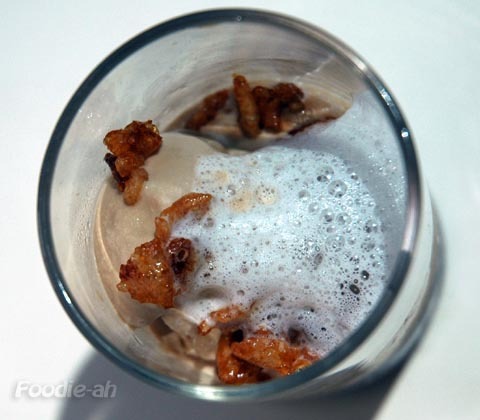 The first dessert I was served was a coffee trifle, which included sponge cake, mousse and coffee ice cream topped by caramelised rice crisps and milk foam. I enjoyed this dessert the most out of the three. Cooling, nice textures, light. 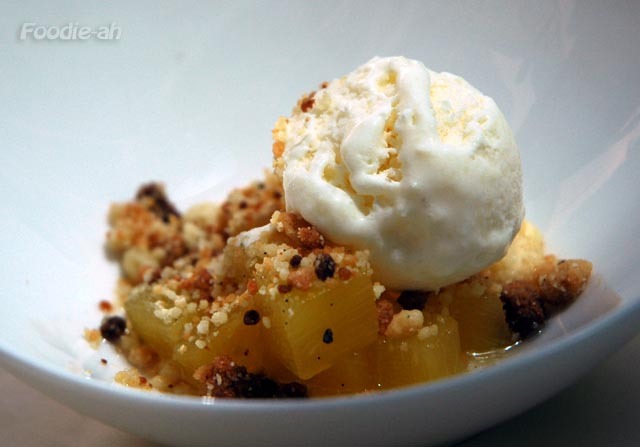 The pineapple crumble was a combination of diced pineapple topped by ice cream and crumble. I am not a big fan of pineapple or crumbles, so this was definitely not my 'cup of tea'. 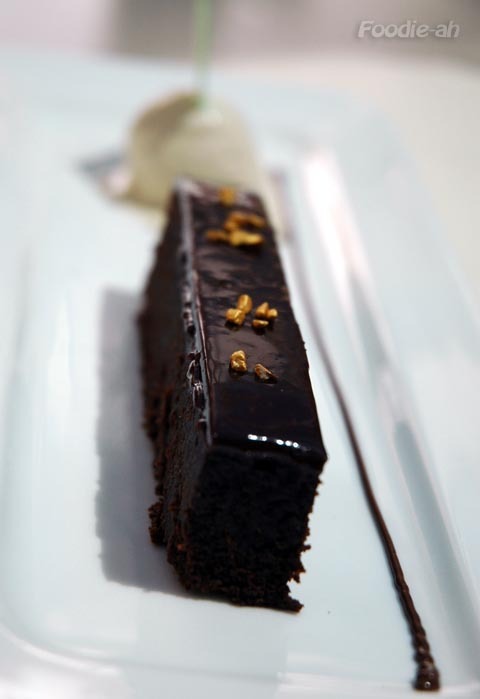 Finally, the well presented chocolate cake was a rich, thick and intense chocolate cake topped by a chocolate sauce and served with a scoop of vanilla ice cream decorated by a wafer of white chocolate. This was a nice cake, although I was so full when this was served, that I just couldn't afford to have more than 2 spoonfuls of such a rich cake... what a shame. 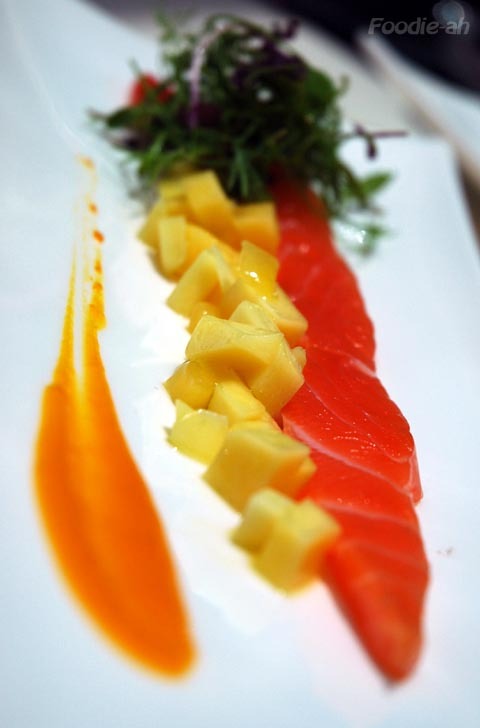 The total bill, including all the dishes described and free flow of juices, came up to a total of $87.10 for 2 people. At about $44 per person, I would say that this is a reasonable deal. You won't love the whole range, but you are served a reasonable variety of dishes and it can be fun tasting them one by one if you are with the right company. However, I doubt I would go back for this. 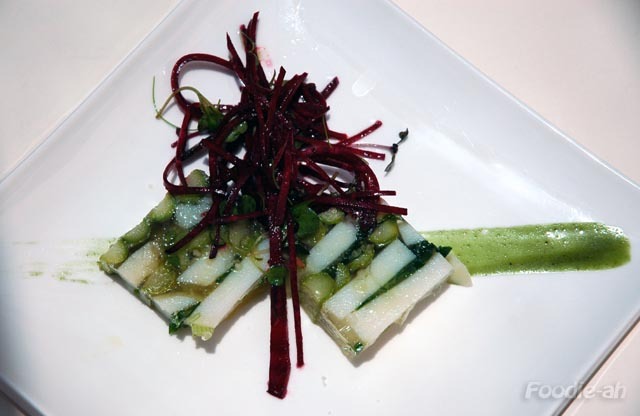 For the same price, I can have a lunch at places like Cassis or Petite Salut (also reviewed on this blog), and although you don't get 14 dishes, you can have 3 well made dishes and you will walk away well satisfied. Personally, I would rather have 3 quality dishes made with care than 14 dishes out of which 4 are bad, 8 are so-so and 2 quite nice. 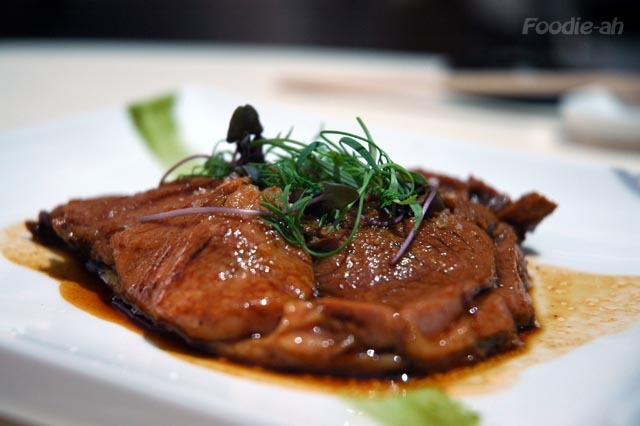 However, I am not discouraging you to try this place as it's good to have a such new offering in Singapore, and I am sure there is a public for it. Wow you had such different dishes. Even the tomato tart is different! Mine had no ice cream. Yes, it's a good deal, but also quite a gamble when you don't know what dishes will be served and how good they will be. I agree. I wouldn't want to penalise their attempt, as I do think they are making an effort to serve something good and different. Other restaurants, on the other hand, intentionally take shortcuts. That's not the case with 7atenine, but it's just that due to the formula they propose, it's impossible to offer quality and consistency throughout. yayy i had been there too! (coz their marketing representative approached me along Orchard Road for a discount card.. ;P) award winning experience!! the privileged card is at $30 ONLY.. but on the 1st visit i got $40 off my total bill..
subsequent visits are either 1-for-1 drinks or 1-for-1 food..
i was like.. WOW!! too good to be true!!! haha..
where is this restaurant? is it still open? Sorry Paulette, the restaurant is now closed.